advanced rider courses. Our courses run on weekends and are open to all riders, of any age or experience level. Students must have a valid, current M1 motorcycle endorsement or learners permit and must bring their own motorcycle (we do not supply bikes). Courses are always 1-on-1 (you and an instructor). Occasionally we will allow 2-on-1 depending on demand. All courses are completely tailored to each individual rider’s skills and needs and consist of all-day road-riding around the Los Angeles area (mixed with the occasional dash of informal roadside theory). All areas of riding will be addressed, but counter-steering, cornering, overtaking, hazard perception and avoidance, positioning and safe use of speed will be covered in depth. The course will enable you to cope with all types of roads and traffic conditions. Our intention is for you to get the very best from your motorcycle and achieve maximum enjoyment while at the same time increasing your safety margins. 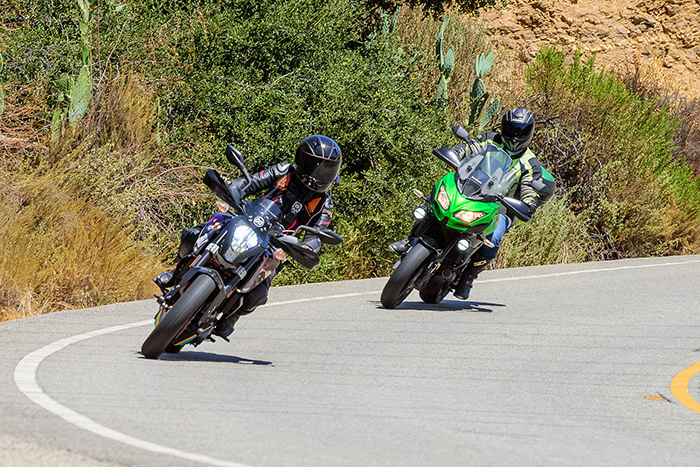 The goal is to achieve an advanced riding technique, showing confidence, accuracy, safety and a smooth, polished ride at every turn and speed. Please refer to our FAQ page for any questions. Contact us at info@socalprorider.com or call 310-562-6903 for more information or to make a booking.